Zal Batmanglij’s THE EAST satisfies as a rare Hollywood thriller with smarts, though it’s not quite smart enough says Timothy E. RAW, who also talks to director Zal Batmanglij. After making waves in the indie world with The Sound of My Voice, its much-anticipated follow-up is another, more polished showcase for the collaborative co-writing talents of on-the-rise actress Brit Marling and assured, young director Zal Batmanglij. Filmmaking friends since college who wowed Sundance with their sci-fi flavoured thriller, The East finds that film's quasi-religious/spiritual/philosophical undertones worked over in a broader, political framework (either too broad or too subtle) and afforded a more mainstream platform thanks to the financial backing of Fox Searchlight and executive producers Ridley and Tony Scott. As Hollywood thrillers go, its premise of a government operative going underground to neutralize an anarchist eco terror cell violently striking back against cooperate maleficence is timely and intriguing, its top notch production values are artfully slick and it's certainly easy to recommend a film that favours big ideas over set pieces. But where The Sound of My Voice was discursive, ambiguous and elliptical, The East's inquisition of government wrongdoers and those who oppose them is far more formulaic. Questions of accountability and impunity on both sides of the law are schematically batted back and forth, always ending in exclamation points. The problem is not that Batmanglij throws his lot in with the members of The East and romanticizes them as outlaws (this is exactly what makes the film so entertaining), it's that a film ultimately more interested in exploring inter-group dynamics instead of politics fails to generate any tension amongst its members. Their loyalty to the cause is never in doubt because the cause itself is never held up for examination. Right before one of their a big corporate offensives (known as "jams"), it falls to outsider Sarah (Brit Marling) to point out that slipping poison into the champagne glasses of guests en masse at a big-pharma gala might be going too far. That not one of them stops to ponder alternative methods of insurgency with a lower body count shows a lack of moral complexity that could have made the film truly fascinating. Explicit reference is made to the kind of self-righteousness that always seems to drive the ill-conceived ideas of reactionary groups, but again, this observation belongs to Sarah and it's one the collective shrugs off without a response. The argument for their stance (relayed in voiceover over disquieting opening titles) serves as a chilling warning but lacks passion and it's hard to buy why conservative, crucifix-wearing Sarah would ever be seduced by The East. To achieve this end the film relies solely on her physical attraction to Benji and while Alexander Skarsgård may indeed be the dictionary definition of handsome, there're more sparks between Keanu Reeves and Patrick Swayze in Point Break than there ever are between him and Marling. Sarah's eventual turn from infiltrator to true believer is not only incredulous but accelerated to the point of playing like a third act twist. A scene in which she all but announces she's switching allegiances to her expedient boss (Patricia Clarkson, nabbing all the best lines), for a moment, turns the character into the sort of impetuous teenager angry at her mother for disapproving of her bad biker boyfriend. The scene elicited giggles in the press screening I attended not just because the dialogue was roaringly on the nose but because there was almost zero evidence of such a sudden transformation. And yet the aforementioned mass poisoning is the ideal and logical place to start charting such a drastic change of heart. Yes, Sarah does play a crucial part in their conglomerate coup d'état, but one that sees her observing from a relatively safer distance. Were she instead forced to step in and actively partake in the attack – offering a CEO a refill when he accidently spills his drink for instance – that change would gradually become apparent through more definitive actions. Batmanglij has already proven himself at crafting smarter-than-your-average thrillers, but its gaping holes in logic like this one that make you question just how smart he is. It could be that we're supposed to put such an abrupt about face down to Sarah's character. Driven to the point of arrogance, an argument could be made that she's naturally a much better fit for The East than she ever was in government. Maybe she became a fully-fledged member the moment she joined the group, she just didn't know it yet... I'm not entirely sure Batmanglij and Marling do either. Often the co-writers are so coy in their characterization, it prompts over analysis. Every time a member of The East referred to one of their activist strikes as "jams", the image of these dirty young things loading up into a van and heading off to play another gig was impossible to shake. It's not clear where the term comes from or if it was invented for the script, but it's another (all-too vague) hint that maybe Batmanglij is not the staunch advocate for the group he appears to be, actually taking a subtle shot at their impulsive rock n' roll attitude. "Jams" suggest teenage kicks of some kind and given the average age of the group, maybe this is some kind of erstwhile rebellion, taken to deadly extremes. In the case of Ellen Page's Izzy, the group's outspoken agitator, that rebellion is a very personal one, and it's when the film starts to broach her psyche that the film achieves the same breathless hysteria of Sound of My Voice. Early in her career tortured teen roles threatened to define a pre-Juno Page, and if nowadays she's first thought of as the whip smart, pregnant wisecracker, her work in the likes of Mouth to Mouth, Hard Candy and An American Crime remains her best. Izzy is a reminder of the darkness Page can tap into so deeply, holding the screen with an intensity that belies her diminutive frame. It's great to finally see her tackle some thornier material again and longtime fans will thrill to her turn here. 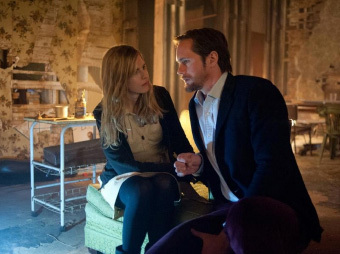 Though it is Brit Marling to whom the film belongs and by whom it is effortlessly carried. Ethereally compelling as ever, her serene expression masks hidden strength and her character though compromised, is a resourceful sheep thrown into the lion's den. A human mood generator, The East's palpable atmosphere is as much down to Marling's mesmerizing presence as it Batmangliji's controlled direction. While it's easy to question her character's motivations, her performance indisputably proves she's one of of the most exciting actresses of her generation. She's got the face, and The East has a Voice that's still worth listening to in an age of over-stylized thrillers. Let's just hope she and her director have a little more to say next time. Director Zal Batmanglij talks to Timothy E. RAW about The East. This video is formatted to be viewed full screen at 720p or 1080p, which can be accessed from the control icon once playing.